Prudence won out and I decided on a much better-defined option. My last 7 blogs (August 29 – October 10, 2017) focused on the doomsday that business-as-usual scenarios are projected to bring about. Based on early signs already visible today, this catastrophe will come from human changes to the physical environment; the world is expected to reach full-force uninhabitability toward the end of the century. My school’s Faculty Day in May featured a panel presentation, “The Role of Science in the Anthropocene.” The audience’s questions mirrored those posited in the NYT article: is there anything we can do to prepare? Or are we doomed? – in which case we should just try to enjoy our last days as happily as we can. The NYT piece was half-satirical and focused on how individuals could start to prepare their own disaster tool kits for local threats. My take will be more serious, collective, and global. The transition to doomsday that I am interested in is different from singular apocalyptic doomsday events such as a nuclear holocaust, the eruption of a super volcano, or the collision of a large asteroid. While we can obviously try to adapt to or mitigate most of those terrible occurrences, none of them is foreseen to impact us the way that climate change based on a business-as-usual scenario will. The eventual uninhabitability that will come from continuing our present changes to the chemistry of the atmosphere will occur gradually – within the span of a few human generations. We can still mitigate it considerably and at the same time try to develop technologies that will help us adapt. I define sustainability as the condition that we have to develop here to flourish until we develop the technology for extraterrestrial travel that will allow us to move to another planet once we ruin our own. This will take time. A better definition would incorporate the options of attempting to establish livability wherever we can, including the soon-to-be-uninhabitable planet Earth. 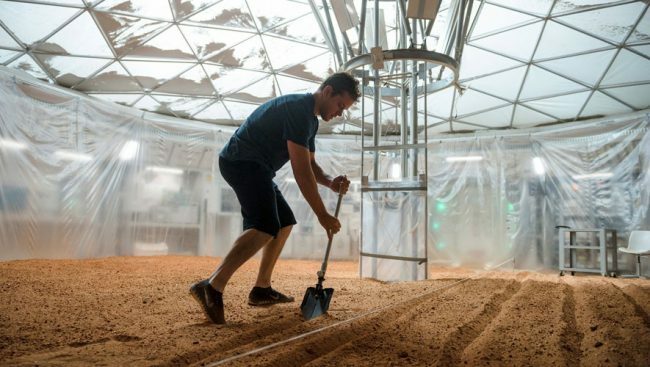 Well, what came to my mind was the movie, “The Martian” – with Matt Damon and Jessica Chastain – about an astronaut who got stuck on Mars and is trying to adapt. Figure 1 shows an example of his efforts. The movie was released toward the end of 2015 and received a Golden Globe Award for Best Picture in the category of Musical or Comedy. As Matt Damon said while receiving the award, it certainly was not a musical and the only funny thing about it was the category in which it was placed. It was a very serious, excellent movie. It described in great detail the work that the astronaut had to put into trying to survive on the uninhabitable surface of Mars. The end of the world as we know it will happen in phases. Some areas will become uninhabitable before others and that shift will likely be the main trigger for an indicator such as perpetual war. In a business-as-usual scenario, the transition will soon engulf the entire planet. How do we adapt to this kind of an environment? Perhaps we’ll simply have to take a page from Matt Damon and learn how to live happily while isolated from the environment. In the next few blogs I will go into more detail. This entry was posted in administration, Anthropocene, Anthropogenic, Climate Change, Sustainability, Trump and tagged Adaptation, Anthropocene, apocalypse, armageddon, asteroid, astronaut, Atmosphere, Australia, business as usual, California, chemistry, Climate Change, Climate Change Denial, Climate Change Deniers, Climate Skeptics, CO2 emissions, David Wallace-Wells, doomsday, Earth, earthquake, Emissions, End of Now, Environment, Equilibrium, extraterrestrial, fire, Future, global nuclear war, Global Warming, golden globe, greenhouse gas, Jessica Chastain, Mars, martian, Matt Damon, Mediterranean, Mexico, Mitigation, Physical Environment, Physics, Population, Power, prepare, Science, Sustainability, Technology, Trump, uninhabitability, uninhabitable, US, Volcano, wildfire, World Population. Bookmark the permalink.